If you’ve seen or talked to me in the past month, chances are I’ve mentioned this granola to you. One of my food52 friends blogged about the recipe in January, and we’ve eaten it for breakfast pretty much every day since, served atop a few spoonfuls of the very sour but delightful whole milk White Mountain Bulgarian Yogurt, sweetened with a squirt of honey. (The yogurt claims to have “up to 90 billion live probiotics per serving”!) Anyhow- this is the best granola I’ve ever eaten, and it’s wonderfully convenient to make a batch and have it for breakfast for the whole week. There are, in my opinion, two things that make this yogurt exceptional. The first is the half cup of extra virgin coconut oil, which lends the granola an incredibly warm, buttery quality. It’s a little pricey, but I can get a jar for $6.99 at Central Market and that makes 4-5 batches of granola. There’s the added benefit that virgin coconut oil is insanely good for you. The second thing that sets this granola apart is the freshly ground cardamom. If you don’t want to take the time to pop the cardamom seeds out of six pods and grind them with a bit of salt in a mortar and pestle, you can substitute freshly ground nutmeg- it just won’t be quite as wonderful. A note about the recipe: I make this without the 3/4 cup of maple syrup the recipe calls for. 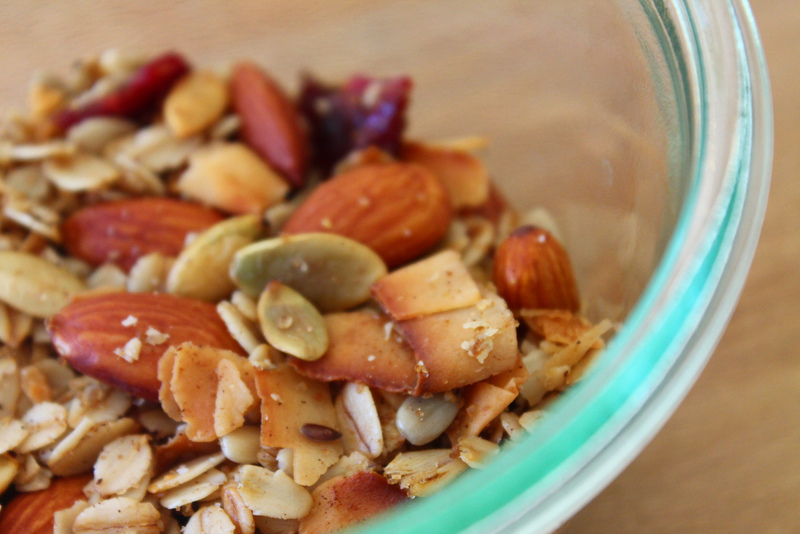 This makes the granola drier, less clumpy, and more like a deliciously crisp cereal. I found we like it better this way, and it seems very nearly sweet enough to me with just the brown and muscovado sugars. Plus, 3/4 cup of grade B maple syrup costs nearly $9 at CM, so it’s more economical to leave it out. Completely your call! Combine all the ingredients except the dried fruit in a large bowl, and stir to combine. Spread the mixture on a large, ungreased baking sheet and bake for a total of 45 minutes, stirring the mixture gently at 10 minute intervals. Remove the baking sheet from the oven, scatter the dried fruit over the top, and allow to cool, then transfer to a large air-tight container. Serve over plain yogurt sweetened with a teaspoon or so of local honey.